In our tablecloth range we have a range of popular colours and designs, however like buying cars, the colour white remains a firm favourite. White tablecloths are so popular because they are easily accessorised with, any small pop of colour from flowers or other decorations really makes a white tablecloth. White is also fresh, crisp and clean. If you are having a dinner party and trying to recreate a restaurant experience at home, a good quality white tablecloth is a must. The shell tablecloth is probably our most well-known design, with its textured weave and scalloped edge, it is ideal for everyday use or for a special occasion. Perfect for restaurants, hotels, cafes and weddings also. It also comes in a variety of shapes and sizes. Square, oblong, round and oval shapes, there are also plenty of different sizes to fit any table. If you prefer the cloth without a scalloped edge we also have a straight edge version. 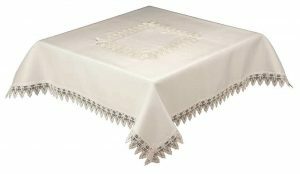 If you are worried at how a white tablecloth will fare with those who don’t possess delicate table manners, they are all stain resistant, machine washable and non iron. Red wine nightmares averted! The shell range has runners and napkins to complement each cloth if you are feeling really fancy. For a more decorated table there is the Bowdon tablecloth. Extremely good quality with a leaf jaquard design, it is a great option for a more special occasion. This white tablecloth comes in a round, square or oblong shape, with the round or square being especially ideal on a small table or as a topper on a larger size cloth. As with the Shell, it is machine washable and easy iron, so incredibly easy care and perfect for everyday use if you prefer. White tablecloths don’t always have to be plain, or a background to something else. A white embroidered tablecloth could be the main event. 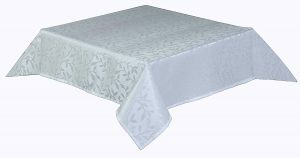 Our Comet white square tablecloth has a flared flower laced edge, with a decorated central panel. This would be ideal for a small table or as a present for somebody special. It needs minimal decoration if any, and is a lovely quality fabric with macrame lace. 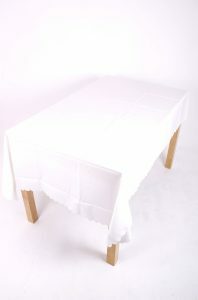 There is also a range of table runners, chair backs and arm covers and cushion covers to match.